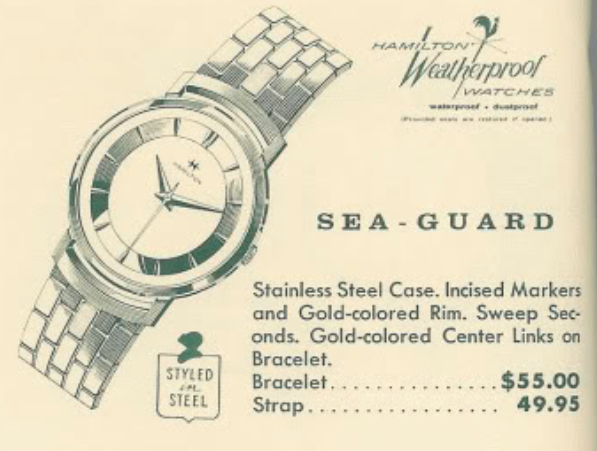 As I'm sure you know, Hamilton named many of it's men's models with men's names. Sometimes they repeated names and there are plenty of common men's names they didn't use. One of the more obscure names they used was the 1951 Clyde. Now I'm sure there are plenty of Clydes out there but I can't think of a single person I know named Clyde. 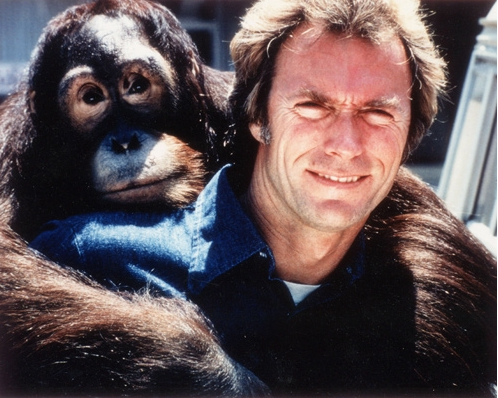 In fact, the only person that comes to mind is Clint Eastwood's best friend in "Any Which Way But Loose"... Right Turn, Clyde. Maybe in 1951 more people were named Clyde. I don't know. Anyway, the Clyde was only offered for a single year. Maybe that was because of the gawd-awful bracelet they paired it with. Talk about ugly. Only an orangutan would choose this bracelet for this model! 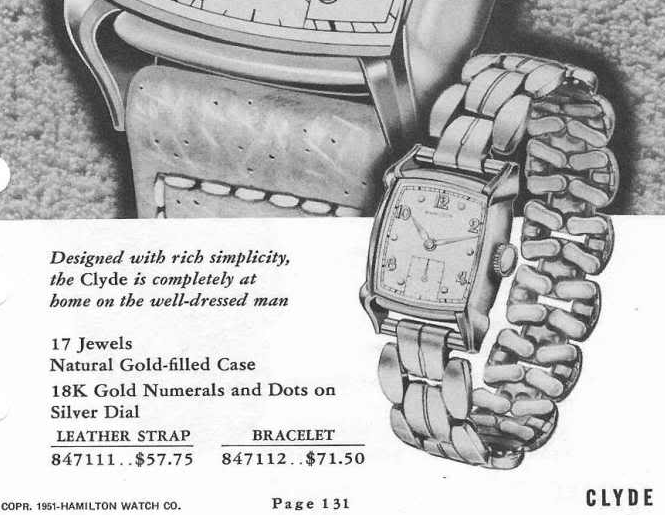 The Clyde came in a 10K gold filled case with a white-finished sterling silver dial and 18K numerals and dots. Tucked inside is Hamilton's 8/0 sized 17 jewel 747 movement. My project watch arrived in typical "as found" condition. 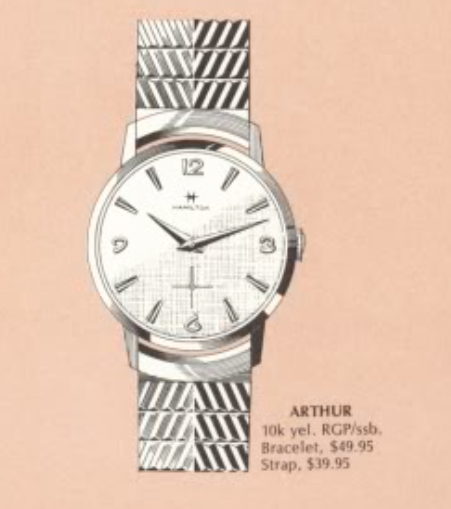 Someone installed a Speidel expansion bracelet that isn't much better than the bracelet Hamilton's designers picked out. The watch is a little beat up but it doesn't really show much wear to the high points, so it ought to clean up nicely. A little simichrome polish will go a long way toward spiffing up the case back. Without the scratched up crystal blocking the view, you can see that the dial is original and in excellent shape for being 60+ years old. The 747 movement is arguably the easiest grade in Hamilton's lineup to work on. You can screw them up, of course, but they aren't as finicky as many of the other movements. The inside of the case back is stamped with the model name. That makes identification much easier. My camera has frozen the movement in time but the balance is ticking away with good motion. Darn, the beat error is a bit too high to let slide. The closer to zero, the better, but I'll usually accept anything in the range of 3 or under. Looking at the underside of the balance, I aligned the regulator pins with the pallet fork so I'd be able to see to what side the impulse jewel falls. It's a little to the right of the regulator so I need to move it counter-clockwise a smidgen. I was able to cut the beat error in half. Good is good enough, especially when every attempt risks screwing up the hairspring. You can see the effect of my tweaking the regulator to bring the two lines horizontal. With a new crystal and a fresh strap, this Clyde is looking awesome now. It's very similar to a lot of other models from the same period. I imagine that is why it only was produced for a single year... that, and the crazy-ugly bracelet, I bet.